Kartik Alan Jairamin began learning the horn at the Singapore National Youth Orchestra under the tutelage of Han Chang Chou and Gao Jian. He holds a Bachelor of Music (Honours) from the Nanyang Academy of Fine Arts (Singapore) and a Masters of Music in Performance from the Royal College of Music in London. His education has been generously supported by the Singapore National Arts Council (Scholarship), Lee Foundation and the Trailblazer Foundation and he is a recipient of the Michael Quinn Award from the Royal College of Music. 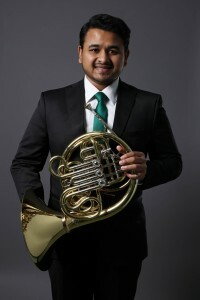 Kartik has given numerous solo and chamber recitals in Singapore, Malaysia and London, focusing on repertoire for the horn in various solo and chamber combinations. He is also the founding member of the wind quintet EDQ who was the finalist and winner of the Composer’s Prize at the prestigious 7th International Henri Tomasi Wind Quintet Competition held in France. Kartik has participated in orchestra festivals in Germany, Austria and Scotland and was recently selected for the Britten-Pears Young Artist Programme (Orchestra) as part of the Aldeburgh Festival (2015). Kartik has performed and recorded with the Philharmonia Orchestra (London) under the baton of Estonian-born American conductor Paavo Järvi and British cellist Steven Isserlis. Kartik joins the Singapore Symphony Orchestra as section horn from the 2015/2016 concert season. His principal teachers include Han Chang Chou, Nigel Black, Simon Rayner and Jeffery Bryant. ©2015 made with love by artplant.